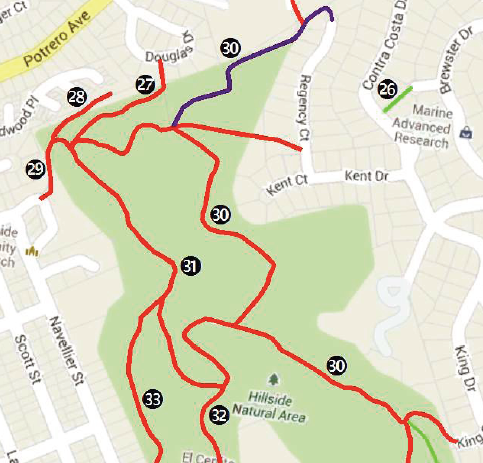 This is one of the lesser known trails in the El Cerrito Hillside Natural Area. 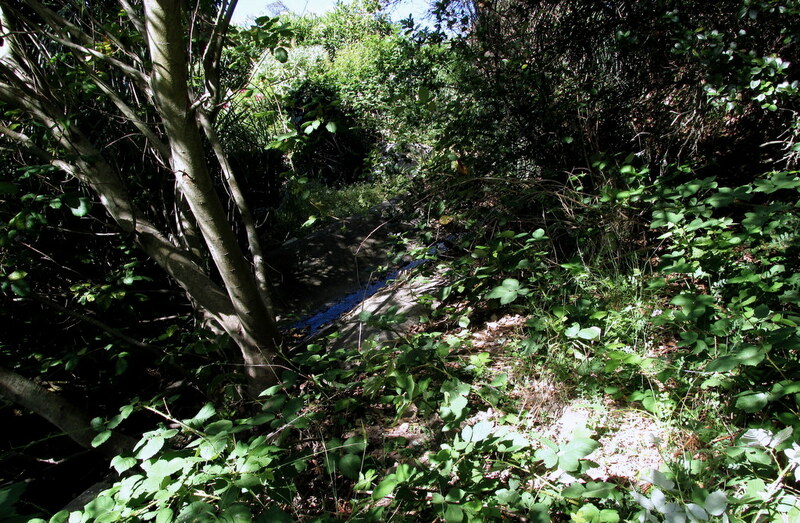 The more familiar, southern portion of the Hillside Natural Area is bordered on the north by the main branch of Wildwood Creek, which flows in an open culvert from an origin southwest of Madera School until it goes underground between Gladys Avenue and Navellier at the base of the hills. On its way down it passes four trails. It begins just west of the north end of the Ridge Trail before it passes into the Madera Open Space. A wooden plank-way crosses it where the Douglas Trail (#27) exits the Hillside Natural Area at Douglas Drive, and it runs along the last stretch of the Navellier Trail (#29) as it reaches the bottom of the Hill and turns south towards the Hillside Church. And in between Douglas and Navellier trails it runs along its own eponymous trail, our subject for this week. Wildwood Creek Trail is a short (less than 100 yard), slightly inclined stretch of road than starts fairly low as a branch off the Navellier Trail and extends in a more-or-less straight direction ENE until it hits Wildwood Creek just a few yards west of the “bridge” at the end of the Douglas trail. The rise is about 50 feet. And calling it a road is being charitable; it may once have been a dirt road, now it is an overgrown track with weeds and wildflowers underfoot and oaks overhanging. There is also a manhole cover, showing that this way owes its existence to a utility right-of-way, which is not uncommon with urban trails. The creek itself is contained in a narrow concrete channel. The channel seems to be made up of solid formed slabs, in sections. In places roots of trees have force up one section relative to its neighbor, or broken into the side of the channel, but the water still seems to be contained. This spring there is little more than a trickle. 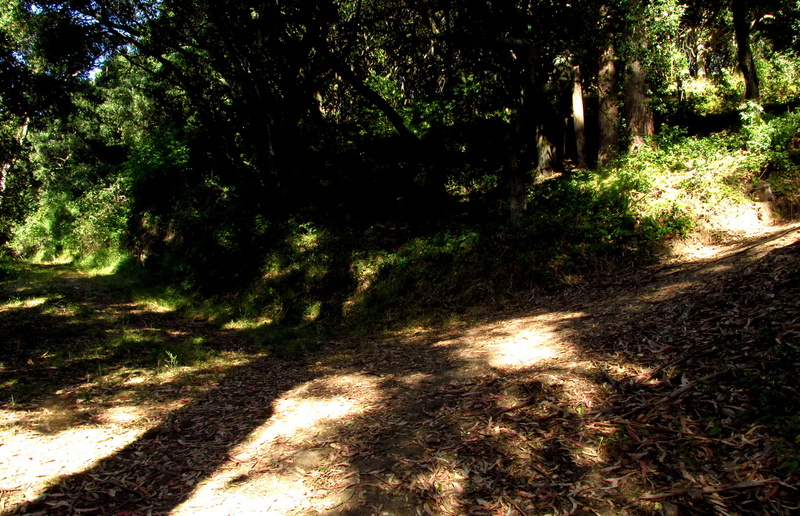 The creek bed turns in a southwesterly directions and parallels the trail as it descends. A deeper gully is formed as you go down the hill. Farther down at least one other concrete channel feeds into the creek from the housing development on the north side. Since this trail is a cul-de-sac that ends in a creek, it could be grouped with the Terrace Creek View, which has a similar function, albeit in a more residential environment. Both serve to allow hikers to see some of the few remaining stretches of creek that are above ground and not behind private fences. These opportunities are limited and should be cherished. You never know when a stretch of creek may be lost. This entry was posted in Trail of the Week and tagged creek, Hillside Natural Area, Madera Open Space, TOTW, Wildwood Creek on June 22, 2014 by ectrailtrekkers.